I was going to wait until tomorrow morning to post this, but here it is almost bedtime and I can't hold this news in any longer. So back in July, a group of us local bloggers got together at TRIO for the first Bleet-Up. And do you want to know something funny? When we were in the early planning stages for the event, and the lovely events coordinator at TRIO asked me how many bloggers I predicted would attend, do you know what I told her? 15! One five! But instead, we got something like 150 bloggers, and everyone there was so interesting and cool. It was then we realized....hey, this local community of bloggers is nothing to shake a stick at. We should do these little get-togethers more often, and in addition to that, have a bleet-up where Austin's blog READERS get to meet all these blog WRITERS. 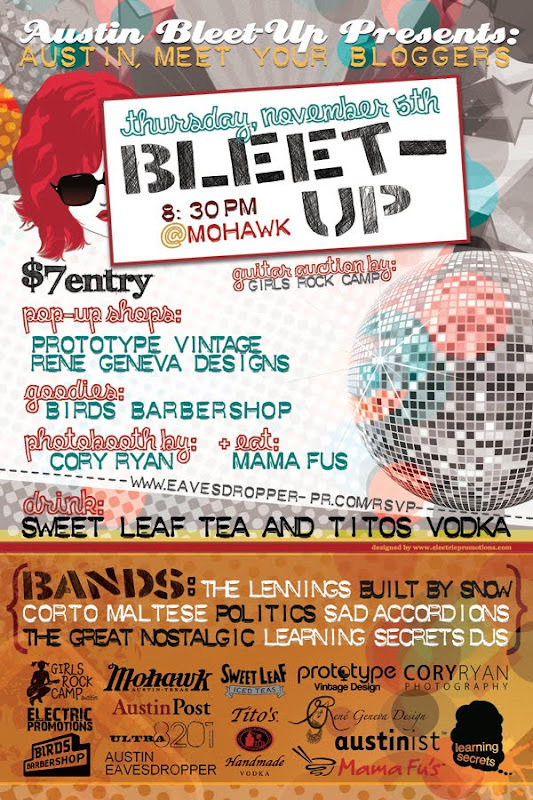 The oh-so-talented Cory Ryan, who did our photo booth at the last Bleet-Up, will do a photo booth at this one too! And finally, there is a special something coming from Birds Barbershop - and I believe it's for early arrivals - so stay tuned on that. Speaking of arrival time, it starts at 8:30. Our fabulous bands begin at 9:45; in between that time we'll be rocking it out on the Mohawk balcony / in their Green Room with Learning Secrets and all our fun sponsors. And our fun selves! To get in, you MUST RSVP. We'll close RSVP's once we hit capacity, so get yours in quick! Tickets are $7 at the door, remember to bring your cash money. Austin Eavesdropper kind of can't believe how official the humble little bleet-up is?! THANK YOU local bloggers for making the first one so great, and for inspiring us to go for it a second time! EDITOR'S NOTE: If you love this poster as much as Austin Eavesdropper does, you've got Candace Carlisle at Electric Promotions to thank. As you can see, girlfriend and her design skillz are mind-blowing. Wow! Can't wait!! I'm loving the poster. HOORAY! Thanks Angela & Jennifer. :) Look forward to seeing your faces there. I do have to say, quite the line up there lady. Really looking forward to hanging with friends and meeting many new people. Very excite! how cool is that!? can't wait! Hipstercrite - Yay! Can't wait to meet you in person, have been enjoying your blog!! Jon - How funny is that?! My cute friend Candace designed that in as a surprise. :) It kind of looks like the super serious dancing face. I might make a cameo. Hey, this time it won't just be a chance encounter! Gotta mix it up a little, ya know. I'm very new to the blogging scene, and I would absolutely love to go to this event and meet all of you guys, I've actually already RSVP'd! !